But it’s not as simple as asking people to link to your website. Unfortunately, actually getting those links is tricky. Google measures links by the number of domains that link to you and the number of times each one links to you. If you have a million links from 10 domains, that can be as valuable as having one link from one million domains. The quality of the domains linking to you also has an impact — the higher the domain authority of the domain linking to you, the higher quality the link is for you. To get more backlinks, start by using tools like SEMrush and Moz to find mentions of your brand and reach out to those sites and ask them to hyperlink those mentions to your website. One of the quickest and easiest ways to start off with link building is receiving awards. Some awards require an entry fee, but if your business is doing things well and that you’re proud of, you should be able to find awards you’re eligible for. Awards websites tend to have some domain authority and will link back to your site, providing a quick win to your link building strategy. Plus, winning awards adds a trustmark for your brand. One of the major challenges with link building is demonstrating value to the person doing the linking. If you have a blog post that you want someone to link to, what can you do to promote them make it worth their while? A way to get around that is to provide value to that company by writing a post for them where you link back to your site within that post. If you’re starting from scratch, you can use tools like SEMrush and Moz to see other domains linking to the websites of you and your competitors to gain a sense of what types of businesses you should pursue. Once you’ve identified the companies you want to guest blog for, check out their existing content, identify how you can add to it and reach out to them. A more specific outreach message gives them immediate choice to move forward with fully built out topics rather than forcing a prolonged back and forth. When starting your guest blogging outreach, start with the websites that have higher domain authority, unless it’d be unrealistic for your content to actually appear on their website. Contributing to industry publications is similar to guest blogging, but the publications operate differently than the websites where you’d contribute guest blogs. Before submitting content to a publication, read over their existing content to understand their editorial strategy and make sure any ideas you pitch are not covered by their existing content. For journalism publications, consider submitting to perspective, opinion or viewpoint sections, where you can write about your experiences in your business. Your pitches to academic publications can be more similar to the educational material you write for your blogs, but should be backed up with data and insights that only you can provide. Industry publications like Forbes, Harvard Business Review and Inc. will have specific guidelines around what type of contributions they accept and how those should be sent in. Some publications will only accept completed drafts and others require pitches. Pitch guidelines will vary publication to publication, but generally require author credentials, a short description of your piece, potential headlines and samples of your writing. Industry publications won’t accept content that seems promotional in nature, so you can’t include CTAs or extraneous inline links. Inline links to your site probably won’t be included in the final article at all unless they’re necessary to the integrity of the piece like a case study that backs up a point you make. For example, “The Art of Strategy Is About Knowing When to Say No” by Brian Halligan includes external links to some of the things he said yes to in the intro. Those links provide examples of what he’s talking about without openly promoting HubSpot. While those examples are important for the intro to the piece, they aren’t important enough to the angle of the article to warrant more description in the piece, so hyperlinking is the most efficient way to provide that context from the content point of view. Some industry publications will include links in author bios, but contributing to industry publications helps you the most by establishing thought leadership and proving your company is worth linking to. Guest contributions are the inverse of guest blogging. In order to forge future link building connections, you can accept contributions from other people who want to write for you. New Breed has a page in the “Contact” section of our website that allows people to submit a form indicating their interest in guest writing for us. This allows us to follow up and begin understanding their topics of interest and whether those topics would be valuable for us. You might get responses from people who are solid writers but have a lower domain authority or don’t have a business at all. This is a win-win — use them to create more content for your website and they’ll be there for you when you need links. Ideally, you’ll get contributions from companies that have high domain authority. Once they write and post their content on your website, they’ll want to promote and link to it since it’s their content. You can also require linking or promotion as a condition of someone guest posting on your website or ask to post a guest blog on their site linking to your domain in return. Co-create content like guides or webinars with other companies that you can both host on your site. Spread the promotional content like associated blog posts between the two sites so both companies are incentivized to link to the other’s website. Linking out to other people is a bit of a long game. If you write a post and link to another domain in it, you can reach out to the post’s creator and say something like, “Hey, I saw this post that you did and liked it so much I linked to it in my post. Thank you!” and include a postscript mentioning that you’d be appreciative if they promote your post at all. That type of outreach can help you build relationships with people who you want to do guest posting with or recieve backlinks from in the future. They may not immediately write a post linking to you, but you’ve established a connection with someone who can help with your link building down the road. This method is effective because you’re providing value upfront. You’re sharing their content and providing them with a link before asking for them to do anything for you. Whenever you post anything online, you should be trying to get it out in front of as many people as possible through every available channel. Just by doing that you might be able to reach someone who’ll want to link to your content. However, social media promotion on its own doesn’t help with link building. Google doesn’t recognize social media channels as a link; it just recognizes them as a channel. The way to leverage social media for link building is to try and share your content with people who’d be willing to link to it and give them a reason to link to it. If you promote things right, you can incentivize people to link to your content or share your content by offering swag, exclusive content or event tickets. On a smaller scale, you should also tag anyone you mention in your posts to drive awareness of your content in hopes they’ll link and share. HARO or help a reporter out is a sourcing service for reporters and bloggers. You leverage it as a source offering information or a reporter seeking information. As a content creator, you can send out a request looking for content on a specific topic, which is similar to sourcing guest posts for your site. This can be useful for writing roundups if you want subject matter experts to offer a specific insight into a topic like “X Strategies to Increase Demand.” In your article, you’ll credit and link to your sources. In return, they’ll link to or promote your post. As a source, you can provide contributions to reporters and get credit and links that way. Before offering contributions, you should do your research about who you’re contributing to and what the topic is to ensure it aligns with your audience. Directories list and review businesses, products or services that fit into specific categories. Getting your business listed in directories like HubSpot’s Agency Directory, Yelp and G2Crowd provides a backlink that’ll help your SEO strategy. 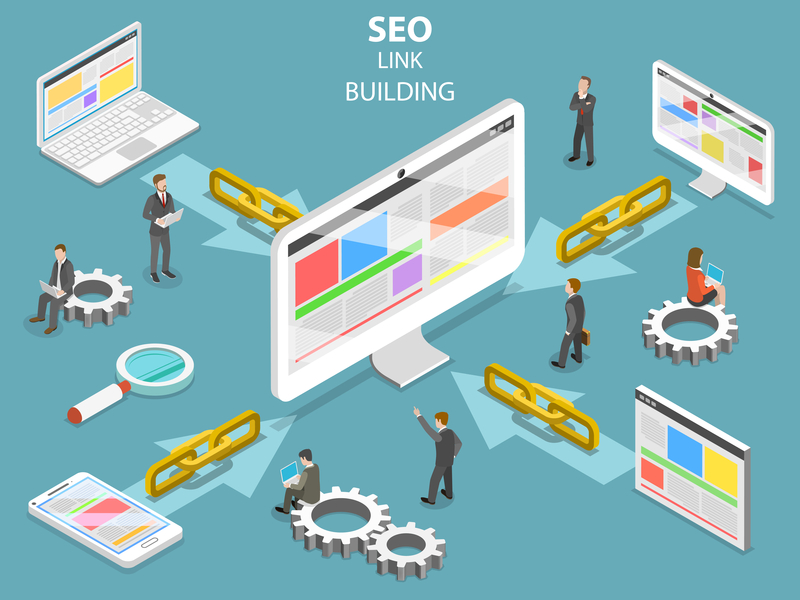 Link building is important, but it’s not easy. In order to make it work for you, you need to know which companies you’ll gain the most traction with and make it as easy as possible for other domains to link back to you. The harder you are to work with, the less likely people are to continue link building with you. As you work on link building, always think about the value you’re offering to the people linking to you. Marketers spend billions of dollars on digital advertising every year.